The Universal Marimba Competition, located in the heart of Europe and acclaimed as one of the most prestigious in the World, gathers the marimba around the globe and foster cross cultural understanding. It has been dedicated with success to promote the popularization and development of the marimba art and culture, sparing no efforts in supporting leading artists and prize winners. Unique in the World, the competition offers aside marimba solo & composition (biennial) also the discipline marimba duo and chamber music for ensembles from duo till quintet with all instrumental combinations (quadrennial) This event is set as a two yearly annual music celebration continuously inviting for the festival top acts and brilliant artistry. The competition received from 2011 the High Patronage of Her Majesty Queen Paola, a Royal honor for the first time presented to a marimba competition worldwide. The additional International Percussion Competition for the Youth was founded in 2015 with the purpose to support and discover young talent. The competition welcomed over 800 candidates from all continents and presents each edition as jury and performing festival artists a topflight of world leading artists. Its position as the leading marimba competition is reflected by the established endorsing contracts and embarking careers of passed laureates and their presence nowadays as leading marimbists of the new generation in the international music scene. It is with proud to witness their artistic growth, international recognition and presence as most high classed performers of the new generation. The impressive offered prizes for each edition with a value up to 70.000 Euro contributed to the competition's top ranking position worldwide. It's without doubt that this ground-breaking event keeps marking internationally a brand new milestone of the marimba, providing an inspirational stage for top performers and candidates and presenting all visitors a unique music experience. The Universal Marimba Competition will celebrate its 20 years anniversary in 2020. The 8th edition will take place in July 2020 for Marimba Solo, Chamber Music and Composition. The Chamber Music category welcomes marimba ensembles from duo till quintet and/or ensembles for marimba with all kind of instrumental combinations (vibraphone, strings, wind, accordion, saxophone.... 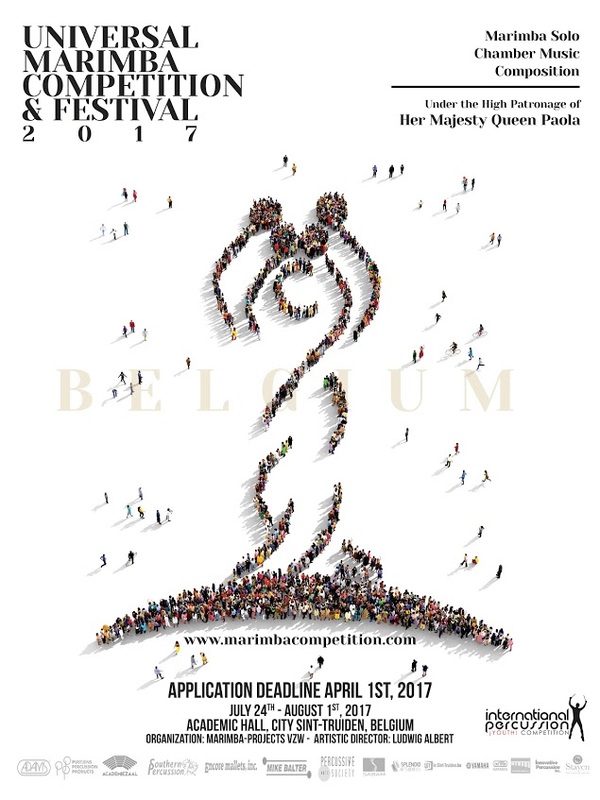 In addition, the 3rd edition of the International Percussion Youth competition will take place during the closing festival. We are looking forward to welcome you in Belgium and wish you a great marimba time. All information will be announced during spring 2019.